On this options page you can change the individual and mixed result ordering. This option will change the ordering of items in the same result type group. Default is "Date descending". Also note, that this is only a secondary ordering, as Relevance is the primary. You can disable relevance ordering on the Relevance Options panel. Custom field name - The name of the custom field. This list will contain some of the most used custom fields, use it in the 'custom field name' section. 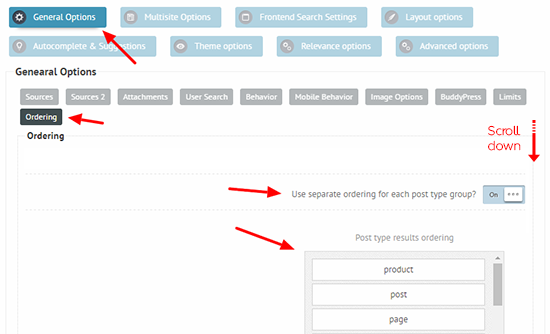 By default all post type results (posts, page, products etc..) are ordered as one group, regardless of the post type itself. If more than one result type group is active then you can order these groups here.